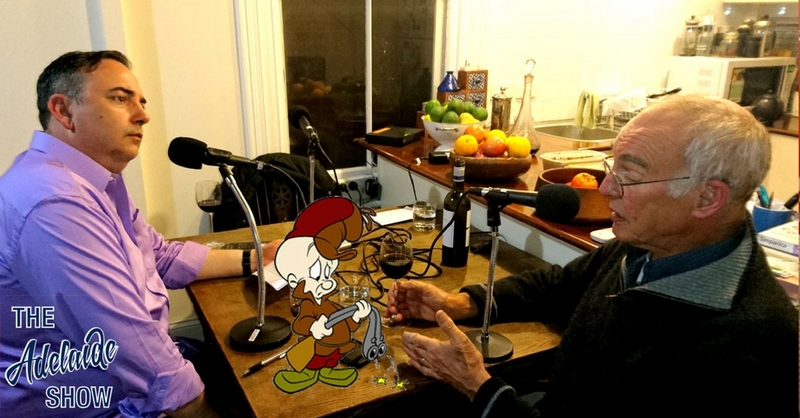 This week, Steve and Michael hop along to Bruce Munday’s place to learn how “those wild rabbits” have thumped their way through Australia’s history. We hear about good intentions, cute furriness, very effective teeth and claws, the trail of damage to this land and its native species, and finally a turning of the tables as we begin to win. Bruce’s book, Those Wild Rabbits, is out now through Wakefield Press. Michael will try to stump us, virtually, with IS IT NEWS on the topic of rabbits. In 100 Weeks Ago we hear from Samela Harris, lover of penguins and many native animals. And in the musical pilgrimage … our musical curator has dusted off a fantastic song we played a few years ago because it was the most perfect song for tonight; house rabbit blues. Bruce Munday is one of Australia’s revered voices in the Landcare movement. Having worked the land but also having inspired bands of volunteers to learn more about caring for the soil, he has become known as a man who can dive deeply into important historical subjects so that unlike the African proverb, when he finally dies, a large library will not burn with him. He has a fascinating book about dry stone fences already in circulation but tonight we are talking about his latest book, Those Wild Rabbits, all about the history of Australia’s love affair with and battle against this furry pest. I liked David Williamson’s comments in your book in which he sums up our story about rabbits in Australia the longest war in human history in which we’ve fought desperate battles, usually on the wrong battlefields with the wrong weapons. Is that a fair summary? You mention these items were memories of home. And yet, today, we encourage migrants to not only mix and integrate but also to bring their best. If we had this time over again, would there be some items or customs from the old country worthy and safe to introduce? an animal with the potential to take over vast tracts of land, limited only by the pressure from predators, famine or disease. Tell us about Thomas Austin and Barwon Park. Why was 1859 a turning point? The first recorded presence of rabbits in South Australia was on the manifest of the Governor Gawler, which arrived at Port Adelaide in 1840 with ‘30 trusses of hay, a cask of oil, seven whalers’ chests and 16 rabbits’. Then , a few months later the Southern Australian advertised ‘100 rabbits, bucks and does, young and old’. And you had a story involving Captain Sturt involving a Mitcham resident out at the beach at Grange. How have we fought back with science? Wasn’t there a new attack in the war recently? If we are too good with RHDV, it will kill its host (the rabbit) before it can mutate into different strains. There is conflict in the outback where rabbits have replaced native prey. What is the status of that balance at the moment? HOPE. At Tungkillo, there is a patch of turf where the war is being won. Tell us about its consequences. Bilby vs Bunny, who should win the beauty contest, especially in the context of Stephanie Pappas’ quest to get imput on what is the cutest creature (seven essential ingredients of cuteness, in order: big eyes, youth, tininess, fur, mammal, smiling and domestication). Can you tell us what the key is to dry stone fences staying put AND where we might see some in South Australia? Michael challenges the panel to pick the fake story from three stories from South Australia’s past. I have given this subject serious consideration, and have come to the conclusion that a most effective means of destroying these vermin would be by the agency of electricity. My plan is to divide the infected portion of country into districts, each district to be in charge of a capable electrician and sufficient staff of assistants, who would be provided with a powerful battery and sufficiency of wire to form an enclosure fence for a circuit of from six to nine miles. It would then be a comparatively easy matter to drive what vermin were enclosed to the electric fence, contact with which would instantly kill them; when the circuit would be removad to another section of the district and the operation repeated, and so on until the whole of the districts had be carefully gone over. No doubt this would be a very expensive operation, but no expense should be spared to accomplish the annihilation of the vermin. (Signed) J. G. SCOTT. Quebec, 12th January. It has been estimated that native cats destroy about two thousand pounds worth of lambs and poultry in Victoria yearly. Eaglehawks and gledes as much, and wild dogs more than either. When rabbits were introduced, they were doing evil with a good intention. Something must be done to protect our farmers. Professor Watson proposes to introduce German rabbits infected with the parasite “sarcoptes cuniculi” in order to destroy existing rabbits but we must wait for the report of the Legislative council select committee before considering this remedy. It seems that pests and weeds grow best both in and out of parliaments. Sir—May I plead one small mite on behalf of bunny? It is not long back the animal was introduced, and has certainly become a sad evil, but in the face of our Society for Prevention of Cruelty to Animals it is dreadfully rough to learn the philosophers have made an attempt to introduce the rabbit scab. It is utterly inconsistent and beyond the ” ken” of a civilized community, and I really hope some better remedy can be found than the slow process of torture so graphically described by Dr. Paterson in his report. I am. Sir. &c.. In 100 Weeks Ago we hear from journalism stalwart, Samela Harris. who has had a lifetime love affair with pelicans. In this snippet, she talks about her enchantment that she now shares with partner in a property near Victor Harbor. And our song this week is House Rabbit Blues by Ben Searcy, selected by our musical curator Dan Drummond. Chatting with Steve and Michael was heaps of fun. Hope that comes through in the podcast. Great to ‘work’ with people who are so positive about Adelaide.